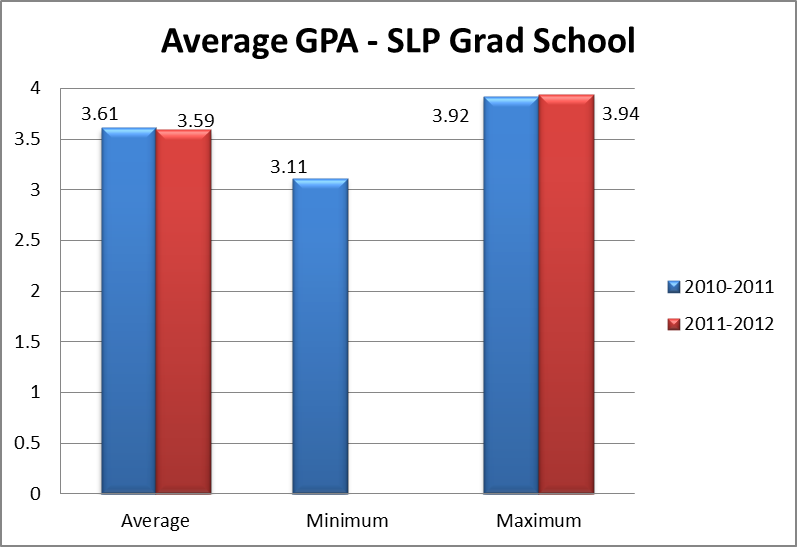 In 2012, I wrote “What are my chances of getting into grad school for SLP?”. It’s my most read post I’ve ever published. I know exactly why, too. People want to know if investing in a career as a Speech-Language Pathologist is easy or difficult and worth the investment. Table 1 shows GRE scores that haven’t been converted to reflect the new score reporting using the ETS Concordance Table. No data was available from the 2011-2012 report. 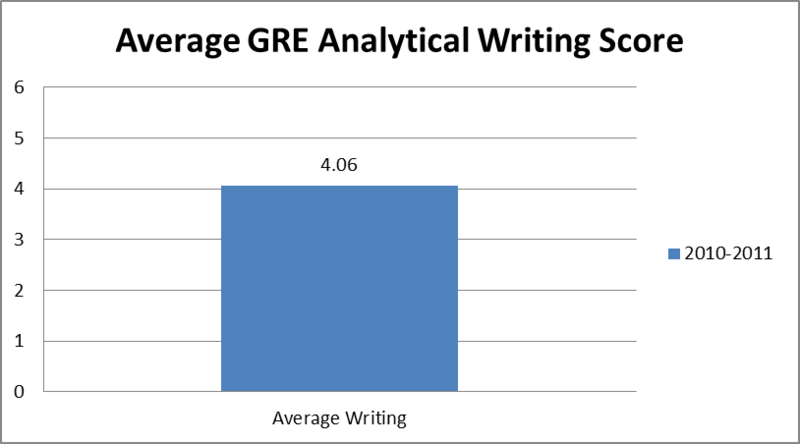 Table 2 shows data for the 2010-2011 writing portion of the GRE. Data for 2011-2012 was unavailable. Table 3 shows an increase in total applications and an increase in number of applications that were accepted. 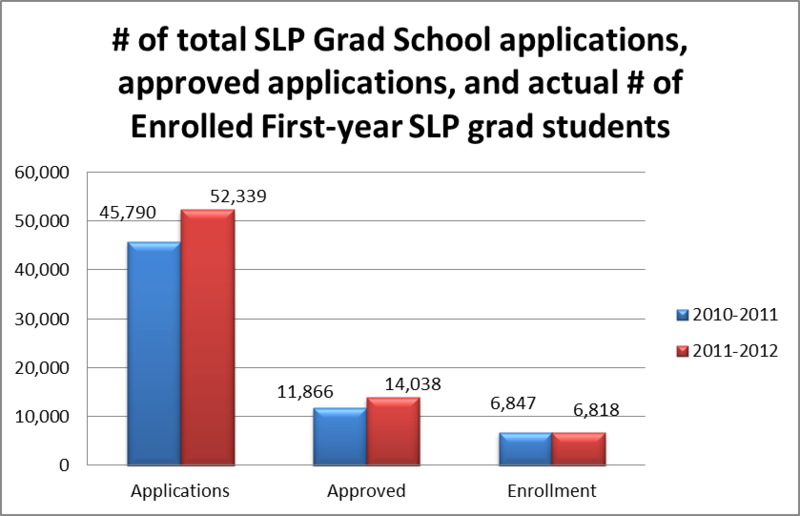 However, there was a decrease in number of first-year SLP grad students that actually enrolled. Table 4 looked at the number of approved applications divided by the total number of applications per year. The number has increased slightly an application being accepted. Table 5 shows the average, minimum, and average maximum GPA from the past 2 years of data. In the recent, 2011-2012 data, the minimum GPA was .00 – I didn’t think it worth charting. Thank you for posting this! You’ve renewed some of my hope for getting in! Fingers crossed. Natalie, that would be the best thing ever. When you click submit on an application, you immediately get an “accepted/rejected” email. That way you don’t wait around for 2 months wondering and hoping. Currently, waiting for my application status. I created a blog about my journey to becoming an SLP because I know that even if I don’t get accepted this time, I will not give up. Thanks for this post and the previous one, interesting info !!! I write this post with a very heavy heart, my daughter has received 5 rejections, one wait list and one yet to reply. She is a well rounded student with a 3.4 and the school she attends didn’t even think she deserved an interview. As the parent that has paid thousands of dollars(no financial aid received) towards all of this I am having a very hard time understanding the process. While I understand the competiveness, I don’t understand how out of country students are interviewed and accepted over people in their own undergrad program who are deserving of at least an interview. So as I write this, the SLP world has lost a great SLP to be, she’s now going to become an RN and that program is very excited to accept her. Do you know the GPA and background of the foreign students? These numbers freak me out. I applied to six schools; already been rejected from three and haven’t heard from the rest yet. I had a 3.04 undergrad cumulative GPA, 3.4 in-major, and all my CSD prerequisites are As and Bs. As for the GRE, I got 160 verbal and 150 quant. However, during college I was working two jobs, did an internship, lived and volunteered with foreign students, and studied abroad. I also double majored and took really interesting but difficult classes because I had the opportunity. Best class I ever took, I got a C- in because it was so difficult. Post-college I volunteered abroad, then back in the US, worked at an immigration firm and now at an early intervention agency implementing therapy service plans. I am also bilingual and have worked with Spanish-only clients almost exclusively for the past four years. I made sure to put all this in my essay but it still doesn’t seem to be enough. It’s too bad it has to come down to numbers. I personally know some 4.0 GPA students who are the most anti-social, neurotic people I’ve ever met, while a 3.0 GPA hard-working girl like me, who LOVES school and learning, can’t move up the career ladder because I was busy clocking out at midnight to pay off student loans. We’ll see in the next few weeks if any program will have me. Good luck to everyone else out there (even if you are my competition:)!! Brittany, I hope you hear good news soon. You are the kind of people I know deserve to be in thr field they want to be. Im sorry thr numbers freak you out. I started writing my blog after friends just like you were struggling getting admitted. Good luck and please let us know how it goes! Brittany, You sound very much like my daughter, she isn’t quite bilingual, but took spanish in college to improve her chances. She also works as a nanny, has done a ton of volunteer work, tutors special needs children and earlier this month studied for a week in Galway Ireland in their speech program. I feel for you and wish you nothing but the best in your search for that school that is willing to look beyond the numbers. Good luck!. Thank you for your nice comments ladies! This is Brittany again and I just wanted to share with everyone that I received an acceptance letter today 🙂 My sister opened it and read it to me over the phone and I was sobbing with relief in my cubicle at work. 1) I had been out of school for awhile. I graduated four years ago then lived/worked abroad and worked at jobs that had me dealing with the general public. My current job has me handling therapy reports and coordinating family service plans with low income Latino families. I wasn’t fresh out of undergrad, and I think that worked in my favor. 2) I majored in Spanish, but I actually speak it. Some majors don’t get to use it, so they lose it, but use it everyday at work (sometimes I go a whole day without English). 3) My saving grace — I wrote a killer essay. Like, I spent weeks on this 6-paragraph thing, and the CSDCAS portal only gives you 5500 characters to write the essay. It was so good, I half have a mind to copyright it. I had nothing to lose on this; I knew that it had to stand out from everyone else’s, so I took the plunge. I didn’t write about wanting to help people, or about how qualified I thought I was, like I thought most people would write. The overall tone was very sassy, especially about satisfying their GPA requirement. I referenced (and quoted) a very well-known nerdy sci-fi TV show. I took a quote from their university statement and kind of threw it back at them. It was bold, and pretty reckless, and I knew they’d either love it, or think “how dare she” and throw it out. Not that I’m advocating this as the way to go for everyone, but this was what caught their attention. Certainly not my GPA. Good luck to everyone out there! It is possible. Thank you to SLP-Echo for the hope you have shared 🙂 This wonderful blog is equally nerve-racking as it is helpful and encouraging. Brittany, it sounds like you and I share some personal stats in common! I graduated with a ba in Spanish in’06, worked with Latino/Spanish speaking families and migrant workers for various education/social service around the Midwest for several years, went back to school for grad studies because I thought I wanted to research second language acquisition and get my phd, changed my mind, found slp, and haven’t looked back! I finally feel like I made the right choice. Plus, now instead of researching about people learning Spanish, I can put my knowledge of Spanish linguistics, language acquisition, and social services to better use by directly helping people who might be having a doubly hard time (access to Spanish language services + language/speech disorders). Anyhow! Where are you attending school? Did you apply got bilingual programs? Brittany, congratulations! maybe you can help me on my SOP & LOI then. These stats are nice! Very useful. Spl-echo I just found your blog and I’m loving it so far! I’m starting a master’s program in just a few short weeks. I have one other recommendation for applications that I feel was really helpful to me, and I’ll share here. Most programs publish their individual program stats/applicant profiles of accepted students. What I did was look at the most recent year’s data, and I made myself a little spreadsheet to see what the program stats were in terms of average GRE scores, average Gpa, rate of acceptance, etc., and then I analyzed my own stats. It took a lot of soul searching because there were schools that I’d had my heart set on. But, after a good, long look in the mirror, I knew that my application wouldn’t be competitive. For example (I can’t remember specifics…. ), all of the programs I applied to had some sort of bilingual or second language concentration, because I’m a bilingual English/Spanish speaker. I was really interested in University of Texas at Austin, but after analyzing my own statistics (I had a good GPA, but just average GRE scores, except for gRE writing, which was higher), and looking at the fact that they receive so many applications, which then means, of course, that the percent they accept is much lower, I decided to cross it off my list. I ended up applying to seven schools, was accepted by four, and was waitlisted by three. All of them had slightly different statistics, but were ones that matched up, more or less, with what I was bringing to the table as an applicant. 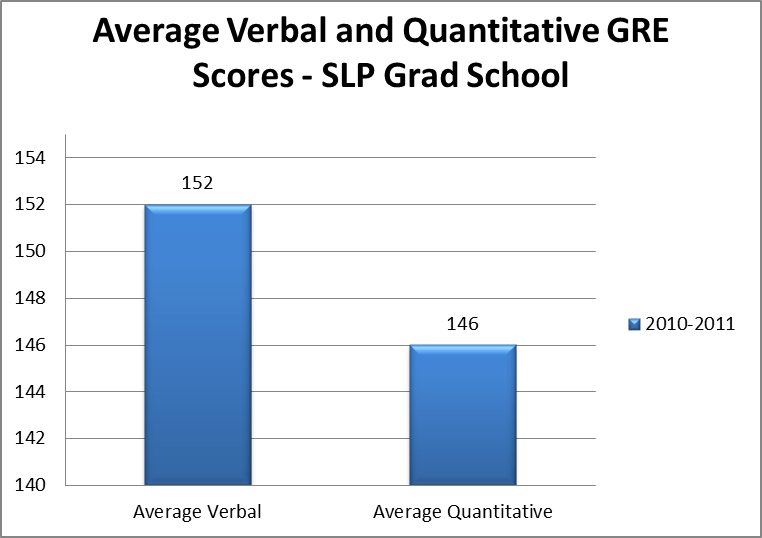 The other thing that I did was apply to schools that are located in areas where there are fewer concentrations of SLP programs. I have the luxury of being able to move anywhere, which I know not everybody does, but if you’re willing to apply to school in, say, Wyoming, that might also increase odds. Just some food for thought, and of course everybody’s individual experience and profile is different, but I am really happy and willing to share what works for me. Codyhappy, where did you apply? You weren’t rejected from any of the 7 and that’s great! Congrats! Hey melissajray – Thanks! I applied to U of Minnesota, Marquette, Northern IL U, Indiana U, U of New Mexico, U of Ariz, and AZ state. All, except NIU, have some sort of bilingual/multicultural track. I accepted at U of New Mexico, moved from Chicagoland to Albuquerque, and couldn’t be happier with my choice! Thanks for the post! I was also in the same shoes back then and still am. But I took the first step to get into the field by studying in the Communicative Disorders Assistant program at Durham College. However, I don’t know how much that will help me in getting into SLP. Also thinking of doing an online masters in SLP, but not sure about how difficult it would be in finding jobs, help! Hello There, I am in the process of applying for grad school. I am still a senior in college. I attend UT Austin. Reading about the hardships of applying for grad school, I got to thinking about my own situation and I want to share with you all and maybe get some feedback? I am bilingual in English and SPanish. My degree is actually interdisciplinary. I have always been interested in how social work and speech pathology work together. I am absolutely passionate about both disciplines. I have always been interested in social entrepreneurship, community development and social work. I am actually graduating with a interdisciplinary certificate in Social Entrepreneurship and Non-Profits along with my B.S in comm science and disorders. I am currently doing an independent research project on my Hometown about the accessibility of speech pathology services for low income individuals. My goal in the future is to keep bridging social work/social justice with SLP and bring about programs that can make these services more accessible to low income individuals in my hometown and the rest of USA. I have done this while continuing my coursework in SLP courses. I have assisted group speech therapy for young adults at our school’s clinic for the past 3 semesters, but besides that I have focused a lot on the social work aspect of my interdisciplinary career. I am sooo afraid, however, that I don’t’ have enough experience in the field of speech pathology for grad schools to think I am fit for a graduate program in SLP, or to continue as a speech pathologist. I figured that since the social work aspect of my interest was not going be taught to me by my SLP undergrad courses, I had to find those opportunities to learn outside, hence why i took on an interdisciplinary certificate. From my experience as a clinical assistant, I also know that I LOVE SLP and I can totally see myself in that field. But although I am conducting a research of my own, I have not done research in actual speech pathology methods/studies or been involved in anything else but assisting at the clinic and this makes me antsy. but is my clinical assistantship and my major GPA enough to prove that I DO love SLP and want to continue this as a career WHILE finding ways to make it more accessible to communities? Why is the minimum GPA in your table higher than the average GPA? It’s its a minimum, shouldn’t it be less than the average?